CHE has the week off. Is it just me, or did this play more like a Saturday than a Friday? I do love a tough themeless, but I CAN’T WAIT (20-Across!) 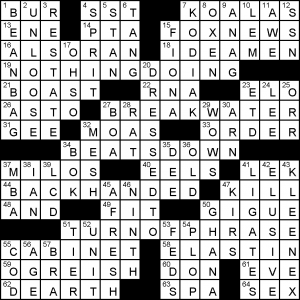 to dig into the Indie 500 tournament’s crosswords on Saturday. Prior Indie 500 puzzles have been tough, clever, ingenious, funny, fresh, and surprising. I expect no different this weekend. Highlights in the grid: the horrific BACONATOR (I continue waiting years for the bacon-on-everything fetish to run its course), tennis MATCH POINTS, MIAMI HEAT followed by Shaquille O’NEAL, IDRIS ELBA, “I’M AT A LOSS” (having two “I” answers is better when both are good longer phrases rather than, say, an I DO, I AM, and a partial), MALL SANTA, SQUEAMISH, and DARTH MAUL. Didn’t know that was a legit form of the word: 12d. [Constantly wanting more], INSATIATE. Insatiable, sure. Dictionary labels INSATIATE as “literary.” Meh. Didn’t know this was a thing at all: 11d. [Assigned, as to do charity work, in modern lingo], VOLUNTOLD. Blend of volunteer and told, I gather. Dirty trick: 22a. [Abbr. for Lucasfilm] is LTD and not ILM, or Industrial Light & Magic. The clue seems much too overly specific for LTD, because there are a jillion Ltd. companies out there. Who’s gonna think this American company isn’t an Inc.? 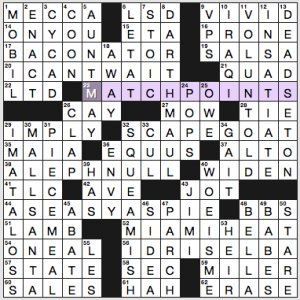 I really wasn’t confident of that L, given the clue for crossing MOBIL: 1d. [Company once named Socony-Vacuum]. That’s oil trivia I didn’t know. And given that Mobil ceased to be a company unto itself in 1999, I don’t like the clue, which sure doesn’t signal that you’re looking for another old corporate name. If you’re not familiar with the CYCAD, 3d. [Palmlike tropical plant], further trouble with the LTD crossing. 51a. [One devoted to Mary? ], LAMB. I think this hearkens to the nursery rhyme “Mary Had a Little Lamb” and not the Virgin Mary/Lamb of God. “Everywhere that Mary went, the lamb was sure to go.” Did today’s college students learn the old nursery rhymes when they were kids? 55d. [Relative of “die”], LES. German vs. French for “the,” in two not-very-closely related languages? They’re only relatives in that both are Indo-European languages. Not keen on the clue. 46d. [Queen’s “We Are the Champions,” vis-à-vis “We Will Rock You”], SIDE A. Blurgh. No. Records have the A-side and B-side. Now! Side A is actually a thing. There’s a Filipino pop band by that name. “Cute and offbeat” is how I’d describe this theme, that I only appreciated in retrospect and solved around in my typical way. for some reason I thought DRESSEDTO/KILL was part of the theme, but there is no asterisk there! Anyway TURNOFPHRASE means several two-part phrases that can form phrases arranged either way, are placed one way, but clued as though they’re the other. NOTHINGDOING is clued as though it were DOINGNOTHING. BREAKWATER/WATERBREAK, BEATSDOWN/DOWNBEATS, and timeous BACKHANDED/HANDEDBACK make up the set. Fill was again above average, particularly for the theme density. I (of course) loved the anatomical zone of ELASTIN/LIGATES with a fake-out tissue clue for KLEENEX! It’s a pretty infinite theme, but no less for that fact. This entry was posted in Daily Puzzles and tagged John Guzzetta, Michael Hawkins. Bookmark the permalink. The SW was brutally hard. The rest was a typical Saturday. Naticked on this one — I had SOW for “do some plot work” and that gave me DARTHSAUL which seemed perfectly reasonable (not a Star Wars fan, needless to say). I also looked at the wikipedia page for ALEPHNULL — can’t say I really understand it (this was the kind of thing that convinced me pure math was not my game) and so I can’t say whether the clue is good or not. The clue for ALEPH NULL is fine (although I believe the adjective “smallest” is only true if one assumes the axiom of choice; so I suppose one could argue it one those grounds). But it’s still not a great answer, in my opinion. It’s too esoteric for even in a hard puzzle. It’s also rarely written as “ALEPH NULL”. In math texts it’s almost always א‎0. And I think it’s more standard to call it “ALEPH NAUGHT”. With that said, I did enjoy being temporarily transported back to my halcyon days as an undergrad when my biggest problem in life was trying to prove the rational numbers had cardinality א‎0. I laughed at DARTH sAUL and thought “what a silly name for a villain!” But the laugh is on me since that entry was supposed to be DARTH MAUL. I first learned about ALEPH NULL from my high school calculus teacher. She was an excellent teacher and used to teach us all kinds of extra stuff that was not in the text book. But I don’t remember a lot of the details so I appreciate reading comments made by others. Ditto the DARTHSAUL error. Ditto the difficulty with the SW. I was delayed there by putting down DONTASKME for IMATALOSS (even though SALES seemed like what the Willy Loman clue was asking for), since it fit so well with TLC and ASEASYASPIE! Very happy to learn the VOLUNTOLD idiom. The SW was my first and least troublesome quadrant. The entire top, especially the NE was very difficult. I don’t do well with words like 11d, which are either neologisms, or made-up words, if there’s a difference. I ended up enjoying it, mainly because I managed to finish it, albeit slowly. I think people found the NYT toughish due to the trivia. I struggled a bit in the NE area because I knew none of the stuff there. My new home includes two cycads, which are common here. BUT, they although defensible, I don’t like that clue since cycads are gymnosperms… Not at all related even though (very) superficially similar to palms. ALEPH NULL is a legitimate term in mathematics. It is the smallest of the transfinite numbers and is the cardinality (“number of…”) of the set of all positive integers.